Staples Vegetables built an anaerobic digester to process out of specification and by-passed vegetables created by the existing vegetable harvesting and packaging process. Maize is also being grown on the farm to supplement the vegetable feedstock. Langage Farm in Devon was looking for a way to improve the grazing quality of its pasture land. It decided on anaerobic digestion to treat its factory waste and manure, returning the digestate to pasture to give significant increases in performance. 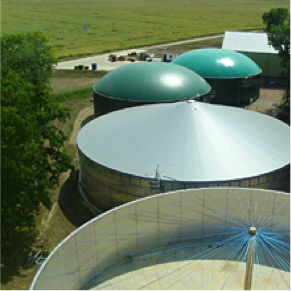 GWE Biogas, based in East Yorkshire, was established to convert up to 50,000 tonnes of organic waste each year sourced from local authorities, food manufacturers and supermarkets, to energy. BV Dairy was looking to cut waste disposal costs, but quickly discovered that with anaerobic digestion it could also make savings to its significant energy bills. A video case study of the site can also be found here. Kemble Farms – In 2008 Kemble Farms Ltd completed the installation of a 300kW anaerobic digestion plant, which complemented their dairy unit and provided another income following fluctuating milk prices. Copys Green Farm – Cattle manure and silage from Stephen Temple’s dairy farm and whey from his cheese making enterprise are fed into the facility, producing biogas that can be used for heat and electricity production. APS Salads – (Video Case Study) Taking a whole farm approach to reducing the carbon and water footprint of their tomato crop. Using a combined heat and power unit, a ground source cooling pump and anaerobic digestion they have gained incredible efficiencies and cost savings. Lowbrook Farm – Owen Yeatman’s Nuffield Farming Scholarship researching biogas in 2004 prompted an investment for his own anaerobic digester facility. Even at a cost of £750,000, Owen is confident that his months of preparation will see him benefit financially in the long term. Kemble Farms, Cirencester – 300kWe, slurry and silage. Copys Green Farm, Norfolk – 140kWe, slurry silage and cheese making waste. Hill Farm, Shropshire – slurry only, self-built plant, using heat-only on-site. Lodge Farm, Wrexham – 125kWe, slurry and chicken litter. Tuquoy Farm, Orkney – 6kWe, beef manure and grass silage. Bank Farm, Montgomery – 125kWe, slurry, chicken litter and apple pomace. Ryes Farm, Dumfries – slurry-only, using heat-only on-site. Corsock Farm, Kirkcudbrightshire – slurry and glycerol, using heat-only on-site. Linstock Castle, Cumbria - 1200ac mixed dairy and arable farm operating a 1.1MW plant. 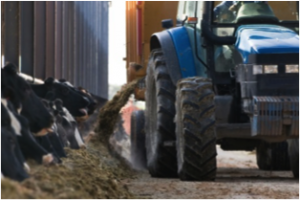 The feedstock mix includes: muck and slurry from the dairy heifer rearing operation; grass silage; maize silage; and whole crop hybrid rye. QV Foods, Lincolnshire - 1.4 MW plant using waste from on-site packing and processing operations, as well as vegetable food waste from other sources. Also growing 8,000 tonnes of maize a year for the plant, on 170ha of land unsuitable for potato production. In the future, rye and energy beet could also be considered as feedstock for the plant. North British Distillery, Edinburgh – using high rate AD to process liquid distillery waste. The BPEX website includes a case study of James Hart and Jeremy Iles' anaerobic digester in Gloucestershire which uses pig slurry, farmyard manure, chicken litter and maize silage to produce heat and power for use in their farmhouse. Surplus electricity is exported to the grid and digestate is used on their arable land.